Click here to view our official By-Laws. 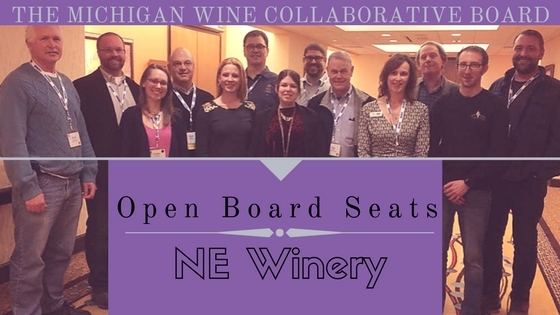 The Michigan Wine Collaborative is led by a volunteer board of directors, elected by the general membership. Board terms are 3 years, with overlapping appointments for continuity. 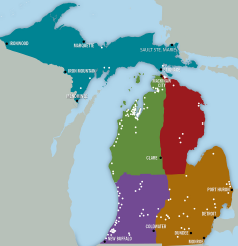 The structure of the board was deliberately set up to include broad geographic and business interests as it relates to the Michigan wine industry. The board consists of 15 seats to be comprised of the following. Notes: The geographic regions are a reflection of the Grape and Wine Industry Council’s breakdown of the state (shown below). Currently the board is NOT yet full. Below is the current board, including vacancies. Owner / Winemaker, White Pine Winery and Vineyards LLC. “Dr. Dave” was born and raised in and around South Bend, Indiana. He graduated from North Liberty High School before attending Ball State University in Muncie, Indiana. Dave received his BS in Biology, specializing in Plant Ecology and Botany. He subsequently enrolled at Michigan State University to work on a Master of Science degree in Viticulture with Dr. Stan Howell in the Horticulture Department. Dave’s MS work focused on the influence of rootstock on grapevine cold hardiness. After receiving his MS, Dave worked as research manager in the Viticulture and Enology program under Dr. Howell at MSU. There, he designed and ran the grape research plots, produced the research wines and directed the vine physiology and enology lab. He worked as the research manager for 13 years, the last four of which were also spent working on his PhD. Dave’s PhD work focused on grapevine photosynthesis and grapevine and vineyard productivity in relation to wine quality. During his time at MSU Dr. Dave authored or co-authored over 35 scientific publications and holds a patent for using Oak products to enhance wines. He has presented his work at professional meetings throughout North America.Dr. Dave has been a member of the American Society for Enology and Viticulture and the Australian Society for Viticulture and Oenology since 1983. Dave worked at St. Julian Wine Company from 1997 through mid 2010. During that time he was promoted from Associate Winemaker to Vice President of Winemaking while overseeing wine sales grow by a factor of 3. Dave started his own winery in 2010 so he could focus on producing those varietals that perform best in Michigan’s unique climate. His goal for White Pine Winery is to produce the very best wines from southwest Michigan’s vineyards and tell the story about our region through his wines. 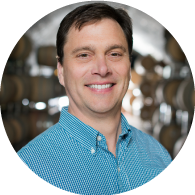 At MSU he teaches CEM 482 – Winemaking, and is involved in developing a new, advanced wine making and analysis course to serve Michigan’s wine industry and continue to improve the quality of Michigan wines. Dave is the President of the newly formed Michigan Wine Collaborative. Additionally, Dave has served on the Viticulture Consortium East Advisory Committee, the Michigan Grape and Wine Industry Council and is presently a member of the wine council’s Research and Education Advisory Committee, the American Vineyard Foundation, the Viticulture and Enology Science and Technology Alliance (VESTA) and the National Grape and Wine Initiative. 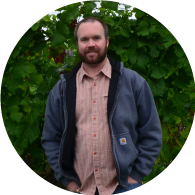 He serves on the USDA SCRI grant review committee for viticulture. Dave is committed to producing the very best grapes and wines Michigan has to offer. Winemaker and Distiller Matt Moersch is partner of The Round Barn Winery and co-founder of Free Run Cellars. An industry veteran of years, Moersch has served as winemaker and distiller of Round Barn since2003 and has served as winemaker for Free Run Cellars since 2006. Moersch has been a leading figure in building the nationally recognized reputation of Michigan’s famed Lake Michigan Shore AVA (American Viticulture Area). Known for his uniquely broad portfolio, Moersch has crafted more than 40 different styles of dry and sweet wines; more than 100 unique beer recipes; and 20 different types of fortified wines and spirits, such as bourbon, rum, and vodka. His career began picking grapes on the family’s vineyard with his brother, Chris, with whom he currently runs both Round Barn and Free Run. Apprenticing with his father, Round Barn’s founder Richard Moersch, Matt learned to make wines and spirits in one of America’s most diverse viticultural regions. He continued his studies with world-renowned winemakers and growers in France’s Burgundy, Champagne, and Alsace regions; Germany’s Rhine region; and Hungary’s ancient Tokay region. While focused on French-style wines and spirits, Matt draws from the vast diversity of European winemaking and distillation traditions, which he avidly explores first-hand, to develop the diverse, award-winning portfolio for which Round Barn and Free Run are celebrated. At both wineries, he oversees and collaborates with winemaker Brian Carlson, the 25-year veteran of California, Oregon, and Washington wineries Moersch brought to Southwest Michigan in 2016. But Moersch’s focus has always been vineyard, and he has spent his career stewarding the vines and soil, working to understand the nuances of his vineyards’ microclimate in order to sustainably nurture his grapes to give up their best juice. Spearheading a new state-wide sustainability initiative, Great Lakes Sustainable Wine Alliance (GLSWA), Moersch is working to bring Round Barn’s sustainability mindset to a broader coalition of neighboring winegrowers. Modeled on Oregon’s premier LIVE certification, the GLSWA will encompass agricultural, cellar, and business practices; including key issues such as the elimination of herbicides from Michigan vineyards and aggressive water-reduction practices. Moersch is Vice President of The Michigan Wine Collaborative (MWC) and serves on the Michigan and Wine Industry Council. All of Moersch’s properties are MAEAP-verified. As the head winemaker for Black Star Farms Lee, oversees winemaking operations for the two processing facilities on the Leelanau and Old Mission Peninsulas. The home farm in Leelanau was created in 1998, with the addition on the Old Mission Peninsula in 2007, to separately specialize in red and white wine production.This separation of production makes Black Star Farms very unique in the industry, and Lee believes is significantly responsible for the general standard of quality that is their benchmark. Lee also directs the distillation program that produces European style fruit brandies and dessert wines, and further enhances their level of distinctiveness in the market. Lee is a proud self-taught winemaker, which he eventually came to following a business degree at MSU, years of experience in the restaurant industry, and extensive international travel. He was an assistant winemaker at a small Piedmont winery prior to moving back to Michigan, where he was born and raised, and returned home at a time fortuitous with the growth and expansion of the industry. 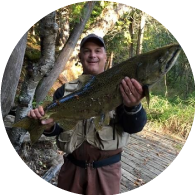 He is an avid supporter of all things Michigan, and proudly pursues the best in Pinot Noir and Riesling. 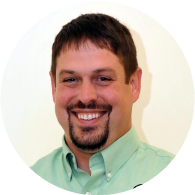 Brian joined the family business in 2012 after nearly a decade in technology sales and marketing. He and his wife Gwen represent the 3rd generation of family to be actively managing Fenn Valley Vineyards in Fennville, MI. Brian’s background in operations and management coupled with Fenn Valley’s vast experience allowed him to assume the title of Winemaker in 2015, a spot held by his Father-in-Law since the winery’s inception in 1973. Today Brian not only heads up production, but oversees overall operations of the business. When not at work Brian enjoys downhill skiing, cycling and travel. Brian and Gwen have two children and live on the farm in Fennville. Interesting in joining the board or a committee? Contact us for more information.